fluff of bird's-eye as there is between a cabbage and a potato. although I would have liked to have seen various ash samples illustrated. and this prompted me to try my inarticulate hand at making one up. because it seems that CPS is chock full of literary types and quite a few very capable quillsmiths. Founded at Dungarvan, Ireland, in 1832, this company specialises in hard tobaccos and Dullahan's Tathagach Bar is one of the firms most popular offerings. It is best known for robust strength, yet smooth mildness, coupled with an aromatic scent unlike any other. Lime water is used in the boilers for the massive steaming presses, which add traces of a tart citric flavour note. adding even further undertones to its odoriferous complexity. most notably, the strange pharmacopoeiac elixir contains valerian root , decoction of figs, cascarilla bark extract, and orris oil. Essence of ambergris is added to prolong the intensity of bouquet. 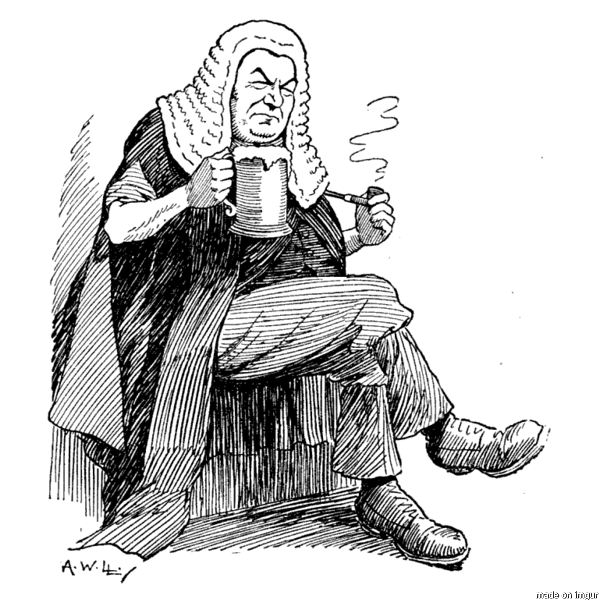 and rather oddly, a fair number of cantankerous old judges. The ash is a peppered dark grey, with the inky flecks having a shardlike character. Density is remarkable. So heavy are the particles of ash that when placed in water, they will actually sink. Very few other ashes exhibit this characteristic. Hardened and compact dottles are also often found alongside. Sorry, I didn't read your whole post. I will later. I'd just like to add that you can mix your ashes with spit, forming a paste, and shine up the silver on your pipes. That is all. as the cover is used a rich deep ruddy Virginia to wrap the outer layer. The manufacture is time-consuming and requires much dexterity. One man and two boys are necessary to produce it, a bench several yards in length is made use of, with a spinning wheel at one end, turned by one of the boys. The other boy arranges a number of damp leaves, with the stalks removed, end to end upon the bench, taking care to lay them smooth and open; and the man immediately follows him, and rolls up the leaves into the form of a cord by a peculiar motion of his hand. As fast as this is done, the finished tail is wound upon the spinning-wheel. It is transferred from the spinning-wheel, by the action of machinery, to a frame connected with it. Subsequently, it is wound or twisted up into a hard close coil, and darkened by immersion into a spirited olive oil which has been infused with various herbs and roots that are said to be Druidic. The long coiled rolls are then slowly roasted upon heated slabs. When this entire meticulous process is finished, the twists appear blackened, as if they had been dipped into an inkwell. The ash is noteworthy as it appears coal black with a gleaming sheen; and when rubbed between the fingers, there is a noticeable oiliness. There remains a subtle trace of its distinct odour. Density is on the heavy side, with a granite-like inner core. The texture is uniformly smooth and firm with no anomalies. Leave it to Mr. Holmes to find clues when none else would. Seems like a fascinating book.